The Secret Language of Money and a Giveaway! I was recently sent the book The Secret Language of Money: How to Make Smarter Financial Decisions and Live a Richer Life to review/giveaway here on Little People Wealth. I must say, this is one of the best books I have read in a long time. Most financial books are boring. I love learning from them, but they aren’t exactly entertaining. This book is both entertaining and educating. 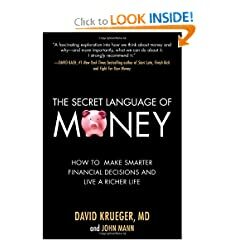 The Secret Language of Money, written by David Krueger, is about why we do the things we do with our finances. The numbers are simple. What’s complicated is what we do with money. We use money to soothe our feelings and buy respect, to show how much we care or how little. We don’t simply earn, save, and spend money, we flirt with it, crave it, and scorn it; we punish and reward ourselves with it. Without realizing it, we give money meaning it doesn’t really have. This book gives great insight as to WHY you do the things you do with money. How do you feel about it? Once you can figure out your faults they are easier to fix! There are worksheets included in the book to help you determine which categories you fall under. There are examples of everything! I learned so much about myself while reading this book. I highly recommend it! You can also register for an Evening with the Author, David Krueger. This is free and will come with free download workbook excerpts. Leave a comment letting me know why you would like this book. Subscribe to Little People Wealth via RSS or Email. If you are an email subscriber make sure you verify your address! The winner will be chosen Tuesday November 24th and he/she will have 48 hours to contact me with their information to claim the prize. Good luck! I am quite guilty of using money for other than its intended purpose. This would be a great way to reinforce better money management and something I could pass on to my children [all are teenagers]. I would like to be able to make better financial decisions. I would love to win this book. I am in charge of our finances and I know I need help better planning. I am also part of the Budget Christmas Challenge. Previous post: Wii Bundle Deal!!! Hurry – One Week Only! Next post: $15 off $15 at Chadwicks + Lots of Clearance!